Vancouver’s beaches and skies will shine bright for the 24th annual Honda Celebration of Light fireworks festival set for, Saturday July 26th, Wednesday July 30th and Saturday August 2nd. Once again Vancouver will be given the opportunity to shine on the international stage during the largest and most prestigious event of the summer, featuring fireworks performances by teams from the United States, France and Japan. Guests will come together on Sunset Beach and English Bay with a weeklong festival of culture, food and of course pyrotechnical displays from some of the best in the world. The Honda Celebration of Light continues to grow thanks to the generous support from the City of Vancouver and the Vancouver Board of Parks and Recreation; Title Partner Honda; Major Partners The Keg Steakhouse and Bar, Concord Pacific and Shore 104.3 FM; as well as Community partners Tourism Vancouver, the Vancouver Airport Authority, Seaspan and Vancouver Pile Driving, Port Metro Vancouver, Shaw, Clearly Contacts and the West End Business Improvement Association. We are pleased to welcome KLM as our official airline partner and CIBC as our official financial partner. 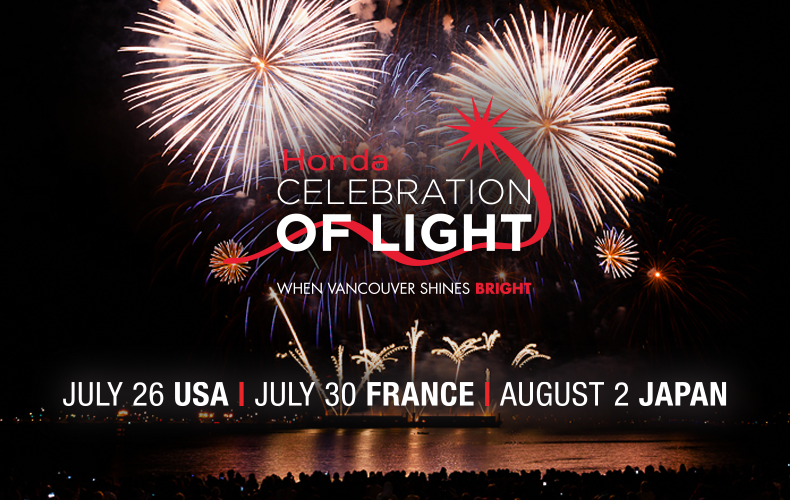 The 2014 Honda Celebration of Light competition will begin promptly at 10:00pm, rain or shine, from the barges located in English Bay. Music simulcast can be heard on SHORE 104.3 FM and through the festival’s mobile app. The winning country will be announced Monday, August 4th. The SHOREfest concert series at English Bay and Sunset Beach returns with free musical performances, including The Sheepdogs on the SHOREfest stage. Organizers also plan to include community and cultural entertainment on the Saturday afternoons on the Rogue Stage at Sunset Beach. More performers will be announced soon. The Keg Lounge presented by The Keg Steakhouse and Bar will once again be located on top of the Bath House Roof at English Bay for the festival. The Keg Lounge offers guests prime viewing opportunities, delicious food offerings, and intimate music experiences from the English Bay SHOREfest stage. Proceeds from The Keg Lounge benefit the not for profit Vancouver Fireworks Festival Society. Early bird tickets are on sale now for $149 and can be purchased at: www.HondaCelebrationofLight.com. Fans of the fireworks can secure reserved seats at the YVR Observation Deck located at English Bay. These convenient seats offer simulcast of the fireworks, prime viewing and dedicated services. Limited Early Bird tickets are on sale now through www.hondacelebrationoflight.com and are priced at $39. Regular priced tickets will be $49 after June 1st. Hotel packages with YVR Observation Deck tickets can be purchased through our partners at Tourism Vancouver. Click on www.HondaCelebrationofLight.com for more information. The festival and the West End Business Improvement Association (WEBIA) have partnered up again, working with businesses to create an even more dynamic and inviting experience for people en route to the fireworks. WEBIA will host a series of roaming performances along Davie and Denman, as well as collaborating with area businesses to showcase the neighbourhood’s impressive culinary and retail offerings. Registration will open shortly for this year’s updated version of the Concord Pacific Seawall Challenge. Families and friends can put together teams and engage in fun activities along the seawall for a chance to win over $10,000 in prizing for themselves and their schools courtesy of Concord Pacific. The Honda Celebration of Light will be capitalizing on the current Food Truck phenomenon to offer guests a variety of culinary experiences from the conveniently located Sunset Beach parking lot. Be sure to come down early and enjoy dinner at the beach. The Honda Celebration of Light mobile App will once again allow festival goers to keep informed of artist schedules for SHOREfest, search through an interactive map and vote for their favourite pyrotechnic team. For more information please visit www.hondacelebrationoflight.com for up to date information and tickets. The Honda Celebration of Light is the largest annual offshore fireworks competition in the world and will attract up to 300,000 spectators along English Bay each evening. Owned and planned by the volunteer, not for profit Vancouver Fireworks Festival Society, 2014 represents the 24th consecutive year of the event, which contributes in excess of $37 million in incremental tourism and hospitality spending each year. The pyrotechnic competition is produced by Sirius Pyrotechnics, with the Celebration of Light produced by brand.LIVE.